Buhari yet to arrive Nigeria two days after leaving U.S.
Asiwaju Bola Ahmed Tinubu, the National Leader of the All Progressives Congress (APC) Bola Ahmed Tinubu, has taken a swipe at the presidential candidate of the Peoples Democratic Party, Atiku Abubakar, over some of his recent claims. 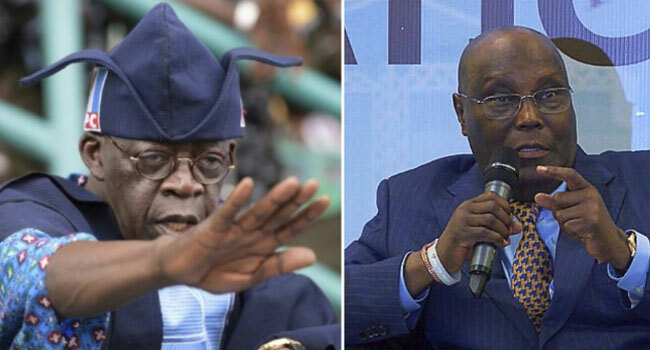 In a statement he issued on Tuesday, Tinubu questioned Atiku’s claim of being a Democrat, saying the former Vice President was only skirting democracy. Tinubu also reminded Atiku of when he allegedly seized the Lagos LG funds despite court orders mandating his then government to do otherwise. The APC chieftain said the recent claims made by Atiku are all an “attempt to cloak his lifetime of undemocratic reckonings”. Below is Asiwaju Bola Ahmed Tinubu’s full speech. The PDP’s presidential candidate, former Vice President Atiku, recently made comments regarding the suspension of CJN Onnoghen. Atiku’s release is entitled “State of the nation address”. I encourage everyone to read it. In its disregard for the truth and patent misrepresentations, it will go down in political history as a classic of self-incrimination. not true. If all of his life has been dedicated to supporting for democracy, then he is far too young to run for president; however, I must congratulate him for having somehow managed to find or begin a second life. This rebirth as a defender of democracy must have taken place only a few short hours ago. installing an unjust political economy on the backs of the people. and Obasanjo improperly removed Senate Presidents more easily than trendy cad exchanges a pair of shoes or changes the subject of his false affections. Your love for democracy is such that you were recently observed apologising to the PDP for not rigging the Lagos 2003 gubernatorial polls as you did the polls in the other Southwestern states. Instead of repenting for rigging at least five states too many, your expressed regret was that you had not rigged enough; that you rigged one stateless than the complete mauling of democracy your party and your principal had mandated. Regarding such a destructive love as this, I am sure democracy and fair elections would rather do without. A few weeks ago in a televised broadcast you even revealed to the people that your official policy envisioned the base enrichment of your friends should you achieve the presidency. I must assume that your life as a defender of democracy began after this long record of unjust deeds and even after your latest statement of intent to mould Nigeria into an oligarchy. If this is not the case and if all these things you have done and said are consistent with your current notion of democracy, then there is but one conclusion. The democracy you now claim to support remains a rather strange breed of democracy, such as to be nigh indistinguishable from the regressive, rentier political economy you designed and foisted on Nigeria as the crafty lieutenant of the bullish Obasanjo. saying that the president violated the constitutional provision regarding the removal of a CJN is inaccurate in that Buhari never intended to remove the CJN. What he has done is to have the CJN temporarily get out of his chair so that the serious matters against him can be heard by someone other than himself. Should the charges show themselves to be wrong or unproven, the CJN will be automatically reinstated as the head of the Nigerian judiciary. However, for Atiku to state that the CJN should remain on the seat while credible and grave charges swirl around him is to put the entire workings of the Supreme Court under a heavy cloud. It is ironic that Atiku of all people throws such darts at President Buhari. Buhari actually exercised considerable restraint in this matter. He has reasonably balanced concerns about the integrity of the judiciary with concerns for the individual rights of the accused. Nothing has been taken from the CJN that cannot be restored if the facts warrant such restoration. Thus, President Buhari conditionally suspended the CJN. By doing so, this allows for the case to move forward without the CCT or others fearing the CJN might use his position to unduly interfere with proceedings. If the CJN is exonerated, then he will return to his position. If not exonerated, then a more permanent discipline awaits him. This is an imminently fair and balanced approach, especially given the fact that the constitution and other laws really do not provide clear and unambiguous guidance on how to proceed in a case whether the CJN is the defendant under this unique fact pattern. While Atiku rails against Buhari because of this act of restraint, we can but imagine the tack Chief Obasanjo and Atiku would have taken if they presided over this situation. By now, they would have put CJN Onnoghen in the stocks or shipped him off to that infamous farm in Ota where he would have begun his new career in plucking poultry. Someone in Atiku’s position would normally be wary of a judge thusly tainted. A politician in Atiku’s position should more objectively be concerned that the government would have been the source of the hidden funds or that government would use the fact of the clandestine money as leverage against the judge to make sure he did government’s bidding for surely this a jurist highly compromised by pecuniary indiscretion. It is almost unnatural that an opposition candidate would champion the soiled cause of such a judge who seems to have sold something in exchange for the money found in his vest’s secret pockets. They said they suspended their campaign because of this matter. Here, they are as illogical as illogic can beget. By suspending their campaign, did that mean they were permanently ending it? Of course not! That would be a boycott or the permanent “removal” of the campaign. No, they have resumed their campaign after temporarily suspending it. If they know the meaning of suspending in this regard, only malign intent allows them to feign ignorance to the meaning of the word “suspend” when applied to CJN Onnoghen. There is no need to quake at the solitary incident of the interim suspension of justice pending the legal resolution of serious criminal claims against him. If this matter is shorn of the political trappings it has acquired, there is no fairer way to handle the matter. Atiku, I gather, would rather leave the man in the seat and allow the charges against him to go unattended. Or Atiku would rather that the CJN preside over his own trial. Such is the logical conclusion of Atiku’s position. It is odd bravery that would lead Atiku to stake such a position. If Atiku is as oddly courageous as he now depicts, then let him venture a step further. Pray to tell, let Atiku tell us what good and the precious thing he and the PDP rendered that they cannot even countenance the temporary and conditional suspension of a single jurist until the charges of illegality against the man have been fully resolved in open proceedings conducted by his judicial peers. Dare Atiku to say what is really upsetting him and what he really is hiding in his attempt to cloak his lifetime of undemocratic reckonings in the swaddling of this much too belated democratic second birth he now claims for himself.